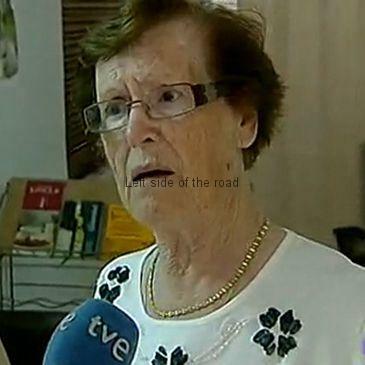 The efforts of 81 year old Cecilia Gimenez in Borja, near Zaragoza in Aragon, to restore a 19th century of the crucified Christ doesn’t get the appreciation she expected as thousands flock to the church to see her handiwork. I’m sure you must have seen something about this story of a restoration that didn’t quite go as well as some people would have wanted but thought it was worth while mentioning, nonetheless, as you might not have been kept up to date with developments. Just in case the story is new to you it’s about the restoration of a 19th century mural in a church in the town of Borja, not too far from Zaragoza in Aragon. The original was by a local artist and some of his family still live locally, which has made it a bit more personal than it could have been. 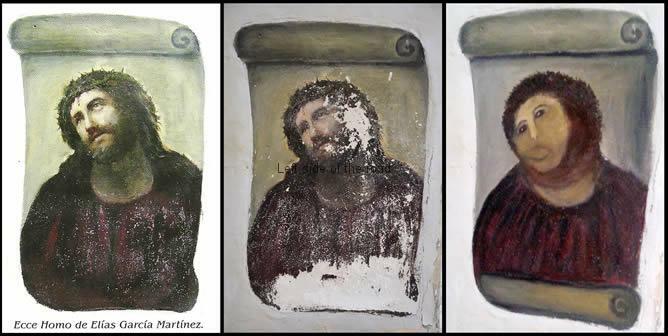 The amateur restorer of the painting was an 81 year old parishioner, Doña Cecilia Gimenez, who could never have thought that her efforts would bring her world-wide fame. She took it upon herself to make the image more presentable for the annual romeria that was due to take place over the weekend of 25th and 26th August. Perhaps she thought her work would be appreciated by the crowds but never in the way that it finally worked out. Dona Cecilia explaining to the world her restoration methodology. In her own defence she has said that the local parish priest knew what she was doing, and as it’s a mural on a wall in the body of the church it’s difficult to understand how anyone locally didn’t know that the painting of the head and shoulders of Christ on the cross was not undergoing some sort of transformation. It’s hardly the case that she snuck into the church in the dead of night to carry out her nefarious deed. When her handiwork was revealed to the world on 22nd August some reacted with horror but as the word spread further afield Doña Ceci discovered that she had friends around the world. Within hours, it seems, a petition was started calling for the restored picture to be preserved as a unique piece of art. Unfortunately she didn’t see this support as something to be proud of and within a couple of days retreated from the world, her friends saying that she was suffering from a panic attack. Since then things have moved on. 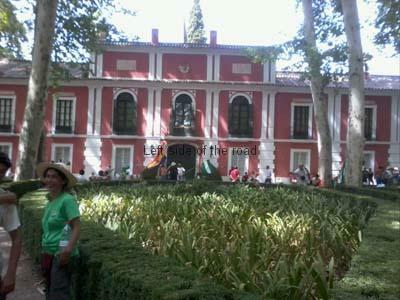 The news of the painting encouraged thousands to come to Borja and visitors were queuing up so that they could have their photo taken together with the new version of the painting, a painting which most people in the past might have noted rather than taken any real interest. I’m not an art critic but I don’t see anything in the original that makes it stand out from the countless thousands of such paintings in churches throughout the world. At least Ceci’s effort is different. Now that there have been so many visitors to the church the priest has said that he won’t be holding a mass until all the hullabaloo has blown over. The family of the original painter are said to be upset; professional restorers are looking to see if the process can be reversed; there is talk of prosecuting Doña Cecilia. Now this last is ludicrous. To take this issue any further would only make the town of Borja, the Catholic Church and any prosecution service out to be the laughing stock of the year. And if she were to be prosecuted then I only hope that the people of Borja who have made a small fortune out of all the extra visitors over the last couple of weeks pay her defence costs. 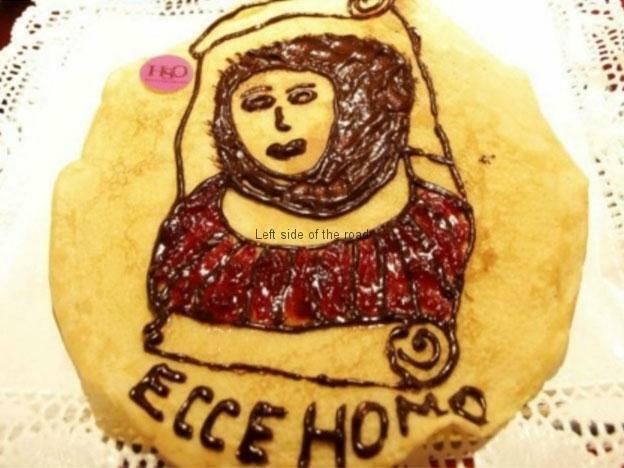 As should the patisseries around Spain that have started to produce cakes with the image in icing. I don’t know if the likes of a Spanish Max Clifford exists (if s/he doesn’t then I’m sure Max is on the case) but Ceci should get something out of this. Who, for example, is the owner of the copyright on the unique image that she has produced? Is its reproduction allowed without her permission? If her handiwork has changed the image out of all recognition to the original can it be said that the dead painter owns the image? 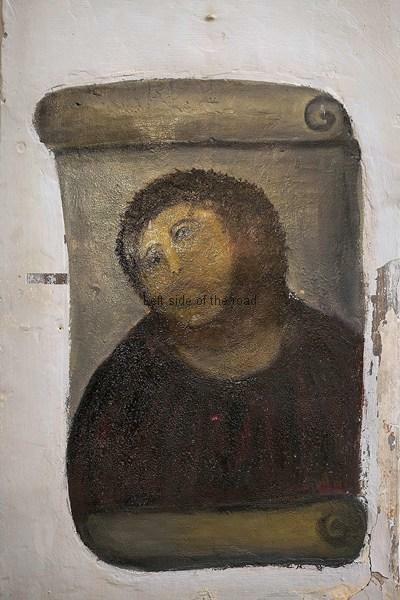 If restorers try to take the image back to pre-Ceci days would they then not be guilty of an act of vandalism? Should she not be getting a little slice of the cake out of which others are profiting from her labour? If nothing else this money could be used for her to take art lessons. Celia’s fame continues to spread throughout the world. One of her paintings is presently up for auction on Ebay, but for the life of me I can’t find it. I will continue to look and if successful will add an image of her oil painting Las Bodegas de Borja (Borja’s Wine Cellars) to this post. Click here to see a news agency report. 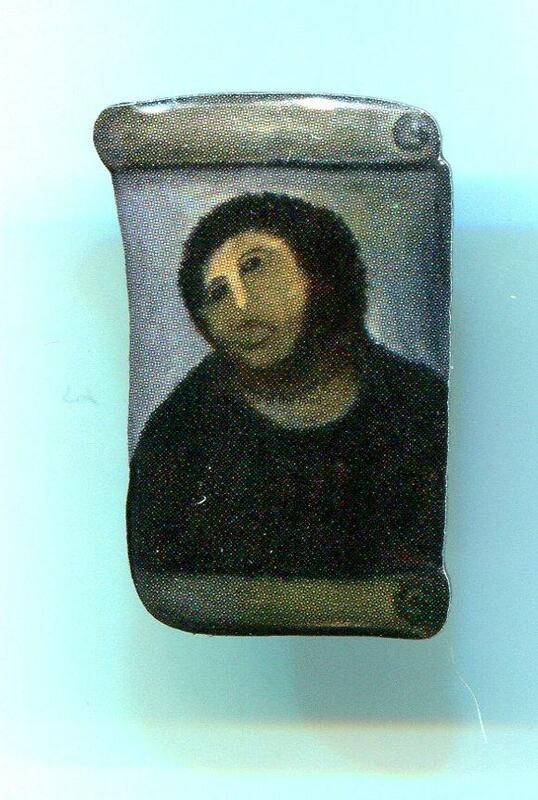 Also, a badge has been produced of the restored painting. 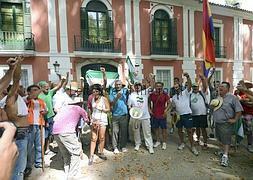 The story goes on and on and no doubt will still be with us next year, when tourism starts up in Borja. 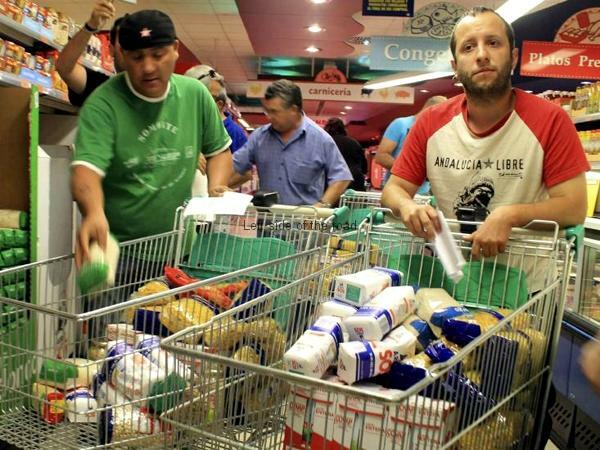 An Andalusian trade union removes trollies of food from 2 supermarkets without paying in order to then provide the basic necessities of life to those unable to afford them. Bankers and others who steal from the public – those who have caused the present crisis – immune from prosecution call for the full force of the law to be used against these ´thieves´. Supermarkets are stuffed full of food (they even throw some of it away at the end of the day) but in Spain there is an increasing number of people who go hungry. What to do? 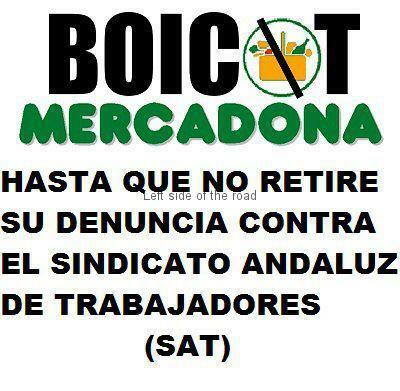 The decision of one trade union in Andalusia, the Sindicato Andaluz de Trajabadores/as (SAT), was to go into two supermarkets, fill a number of trolleys to the brim with basic and everyday necessities and then walk out without paying. This food was then distributed to people who had no money whatsoever to buy such necessities. This follows, in a number of ways, the scenario of the play ‘Can’t Pay, Won’t Pay’, written by the Italian satirist Dario Fo in the 1970s. Checking some information about this on the internet I see that there are a number of theatre companies around the UK who are, or have been, performing this play as it rings so many bells in the contemporary situation in many European countries. The attack on the supermarkets happened on Monday 6th August and I don’t know what sort of coverage (if any) this has had in the British press, the Olympics being useful (yet again) to hide any bad news or anything that might be important. SAT argued that in a society, and at a time, when money was given to bankers and their ilk by the wagon load there was ample justification for their actions. Not surprisingly the owners of the two supermarkets, Mercadona and Carrefour, did not agree and have been calling for the full force of the law to be used against the individuals directly concerned as well as the trade union. 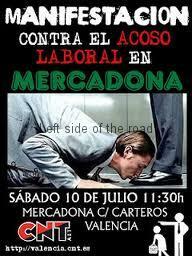 In response the union has begun a campaign for a boycott of Mercadona, being the most vociferous in its call for the use of the courts to defend the sanctity of private property, until they withdraw their claims against the union. It seems the company has a history of illegal and unjustified sackings with accusations of discrimination being upheld in the courts. That would seem to be one of the reasons that that particular supermarket was chosen for the raid. Mercadona – the perfect employer? The last news I’ve seen is that those who’d been arrested have been released but the matter will not rest there. Not to prosecute could lead to copy cat activities throughout the region (if not further afield) but taking them to court could turn them into martyrs. The propaganda war is already on with local people being interviewed who say that such action goes too far but don’t offer any suggestions about what should be done instead. It’s early days yet but will try to keep an eye on developments. One bit of information I received whilst discussing this matter is the fact that there is (or at least was) a law under Spanish jurisprudence that allows for the hungry to take food, as long as no violence is involved. The fact that the food taken in these supermarket raids could not be classified in any way as luxuries might well mean that this case could fall within the meaning of this law. Being, as we are in the UK, used to ancient laws being resurrected so that the state can exact its revenge against workers (such as the Shrewsbury Three) or brought out to pull the state out of the mess it has got itself into (such as the Pentonville Five in the Dockers’ Strike in 1972 with the mysterious one and only appearance of the Official Solicitor) it’s interesting that a law exists which can be used by workers. Not that we should put any faith in laws introduced by a capitalist state. In Britain the tendency is to suffer in silence. When people do take the law into their own hands, as some did in different cities throughout the UK this time last year, they were condemned because they stole trainers and TVs and NOT foodstuffs. Would people’s attitudes have been different if all that was looted was the milk, eggs, potatoes, flour and the like used to produce a healthy and substantial meal? Now that would be a real danger to society. The images in this post depict the general argument of the Union. 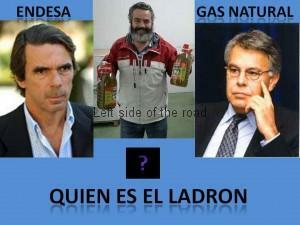 Who are the real thieves? The ones who steal cooking oil to give to the hungry, or those who seek to increase their already vast fortunes, including ex-Prime Ministers, of both the conservative and so-called socialist breed. Although in Spanish you can click here for the link for SAT for more information on how things are developing.